Finally! The tour we've all be waiting for! Byron and I were awaiting several final touches before showing off this room, and now, all is in place. 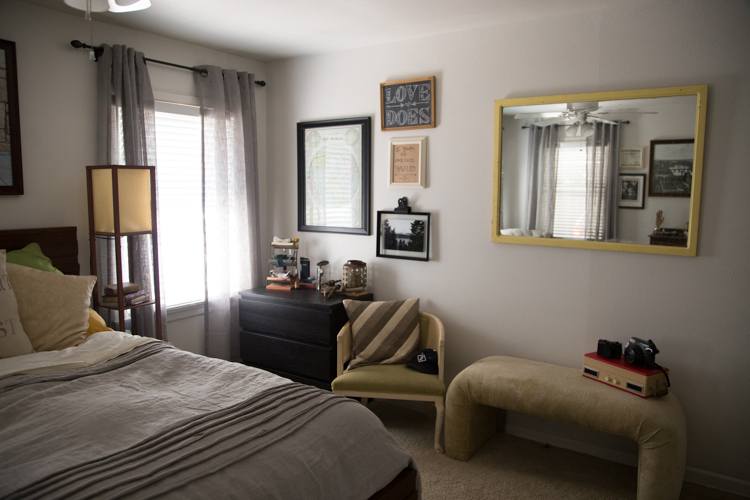 We really love how cozy and bright this room turned out! It is our first venture into white paint, and I adore it. It completely brightens a space and allows everything to pop! Like most, we have a his side and hers side, the "hers" side doubling for both females in the Griffin house, canine and human. Mine is featured above on the left, and Byron's on the right. We both have little reading nooks, though we prefer the comfort of our bed when getting lost in novels. Some of the "final touches" we were waiting on include these curtains. Simple as they are, curtains truly do make a room. Per suggestions on Pinterest, we hang our curtains at least a half foot higher to make the room feel taller. 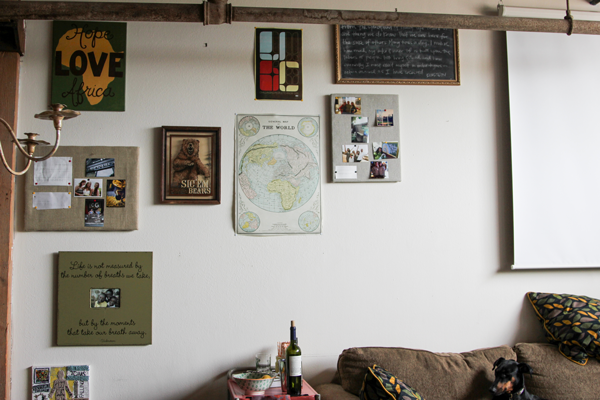 I can't seem to resist a gallery wall feel, and so, both sides, feature a small one as well. I adore Byron's side. He doesn't have the jewelry or makeup like I do, so he sports old tools from our grandparents, outdoorsy & travel books, a lantern, and a beer stein. So much of our house is hand-me-down from our parents and grandparents. All these little things represent who we are, who we want to be, who we came from. Stories lie around our house. The cozy corner. I dream of mornings of reading here with the dawn's early light. But, as summer is nearing it's end, the sun is not coming up early enough to wake me and draw me into the chair. Rather, it's tardiness invites me to remain nestled in the cozy bed. Below, my space in our room. I have been to Paris twice, only for a few days in total, but I sure do enjoy the stories, the feel, the fashion, the food. Next to my bed--Paris: A City in the Year of Light (and Dark chocolate). Thus, I have tried to give my space a Parisian, lady-like, sophisticated & chic feel. The print on the bottom right was a gift from my grandmother, a mostly watercolor painter from the Dallas area. Another pinterest idea, the framed fabric holder, sports my favorites pieces of jewelry. And back to the centerpiece, one of my favorite wedding photos, a 30x40 we ordered, and cut to fit a 27x40 frame (talk about a hassle!). I just, mmmm, love this view. This was the absolute final touch we were waiting on. Did it come out beautiful or what? The pillow was a Christmas gift from my mother! "Earth without art is just 'eh'." We love this space! What do you think?? I couldn't stop at just one room. Our guest room has been "ready" awhile, at least ready to stay in. So, come visit! Welcome to Part 2 of our multi-part house tour! If the theme song from "The Office" started playing in your head, you win major points. The chalkboard doodle above our computer is from the opening! I love cork board and I couldn't resist adding a small trim right above the computer. What do you think? 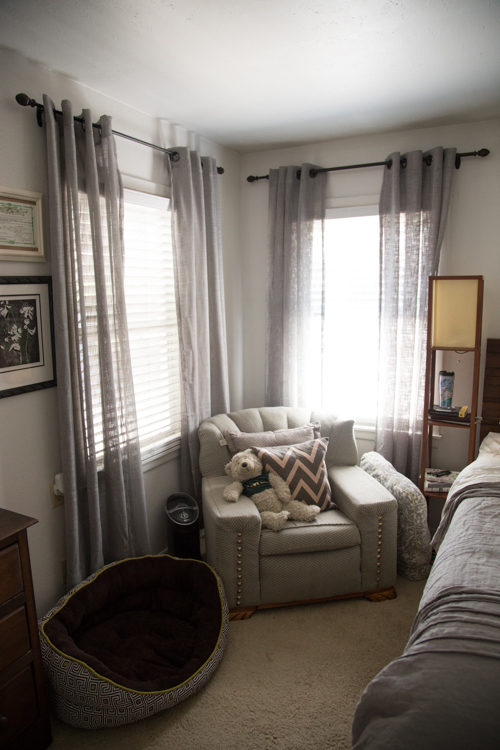 When we first arrived to the house, we thought this might serve as the guest bedroom, but upon looking out those windows onto our "extra room" behind the house, we decided to be kind and allow our guests some natural light. We don't mind not having natural light in the office, and I have really come to like our faux "by the window" chill area. The featured leather recliner was another great furniture piece Byron brought into the house! The built in drawers serve as a perfect place to house all the equipment for our various hobbies and on-the-side jobs. I quite enjoy our differences in the creative field and the way our spaces tell our visitors about us. 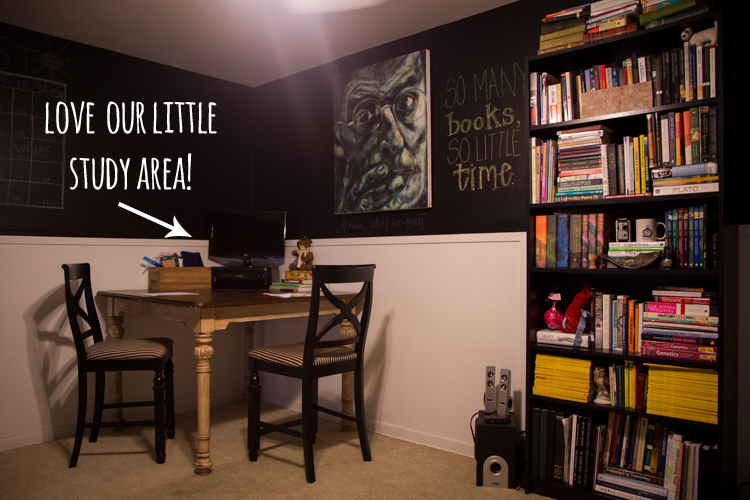 Below is our bookshelf and our cute little corner study area! I can't wait to be furiously working away at that table with Byron, running to the kitchen for coffee and returning with mugs and a snack to share. I actually don't see this happening all that often, but it sounds so cute, right? You already know that we have such talented friends. The painting of "Mr. Intellect" (not the actual title, just my preferred name) was created by the lovely Meredith Richey--check out her stuff. So good. We really can't describe how much we love this house. This room and what we have done with it thus far certainly add to that love. Besides the living room, this is our second favorite room to hang out in. Compared with my last 5 years, it really does feel quite different to leave my room, but stay in the same space to accomplish things. But, just so you don't think we perfected a home in two weeks...here is a peek at what's behind the curtain--junk! We have stowed lots back there because we just can't figure out what to do with it all right now, and that is perfectly okay. If this house is teaching us anything, it is patience. 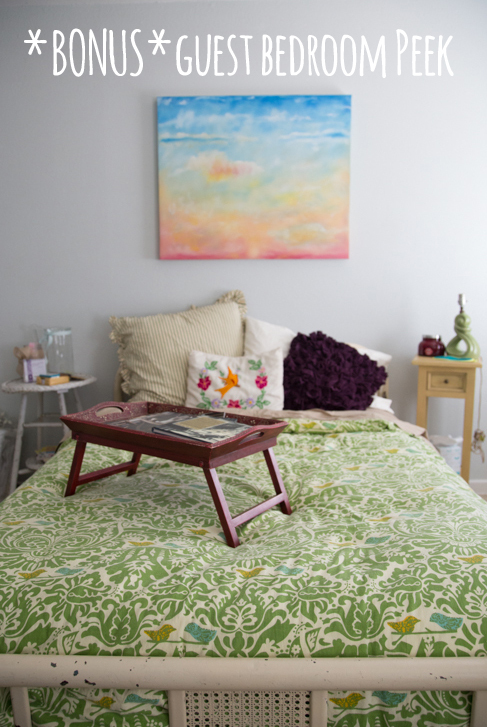 Rooms don't paint themselves, clutter doesn't organize itself, and furniture doesn't just pop up in the perfect place. With patience and a little bit of work here and there, this room and this house are coming together quite wonderfully. Come do your work here! Forget the coffee shop, we make an excellent cup of whatever you want. Hope you enjoyed this room...much more to come! Finally! 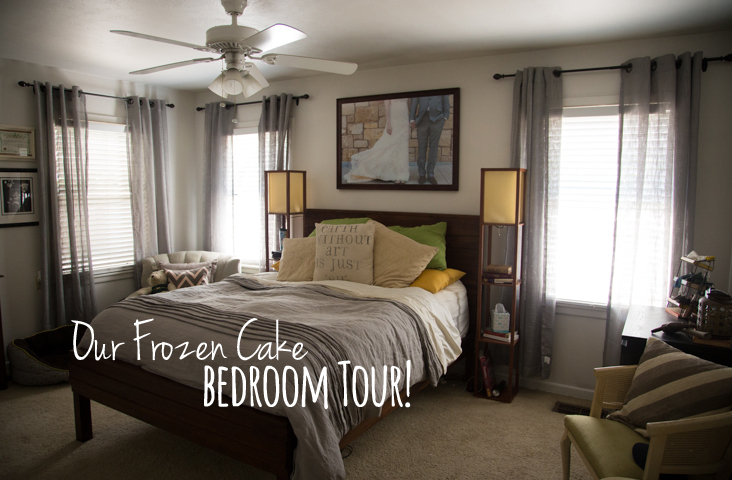 Today we are excited to share the first part of our house tour with you! 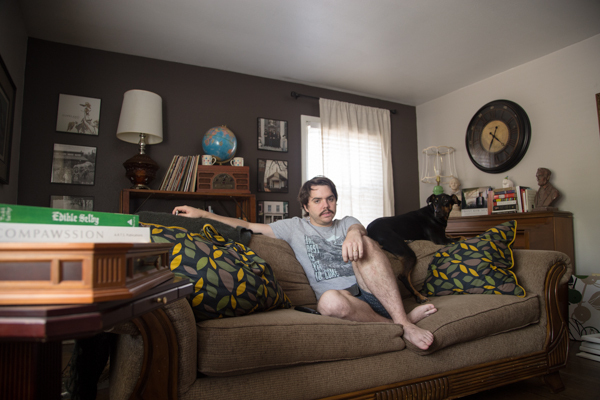 As I have said earlier, the living room was our main priority as it is the room where we will spend the most time and the first space people see when they come over. We had hoped to paint the accent wall to match the rest of the room, but matching paint is hard, and since we only have our lease for 11 months right now, we just didn't care. So, yesterday I hung the last few things and ta-da!, today you get a tour! 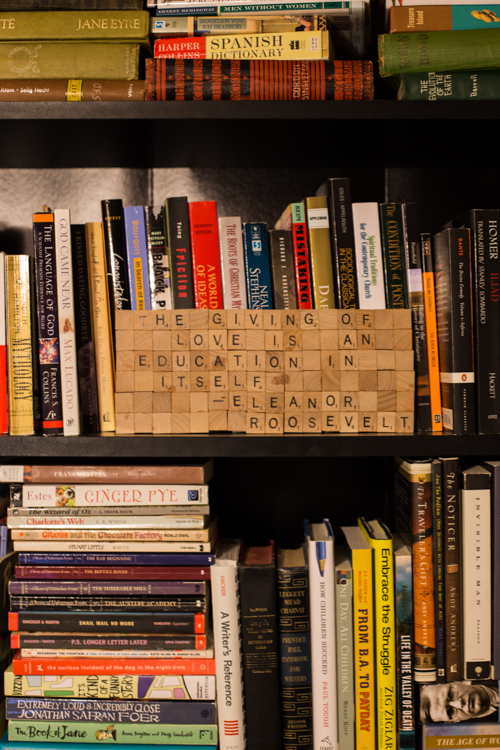 I'll start with my favorite piece in the whole house...this bookshelf! I found this on a shopping trip with my mother two years ago before I moved into my first apartment. I HAD TO HAVE IT. She and I negotiated between ourselves what the pay breakdown would be between us before we moved on to haggle a great deal out of the shop owner. 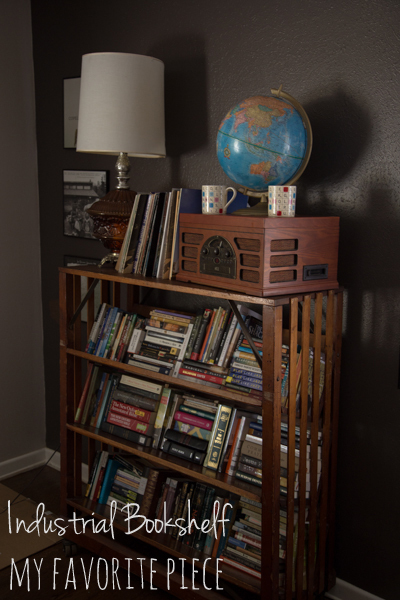 I have loved this bookshelf in each space, and here I cherish it as it holds not one collection of books, but now two. You're welcome, Byron. We framed the bookshelf with 6 record frames. I personally believe record frames are one of the best investments. Inexpensive and you get to show off your taste in music...or your parents, which happens to be the case for me. Thank you, dad! Growing up, my family, though none of us piano players, had a upright piano in our living room, much like this one. It is crazy that I would meet, and marry, a man who has been (undertaking the great pain of...) moving this one around for three years. It is the one his mom used to play on as a girl. 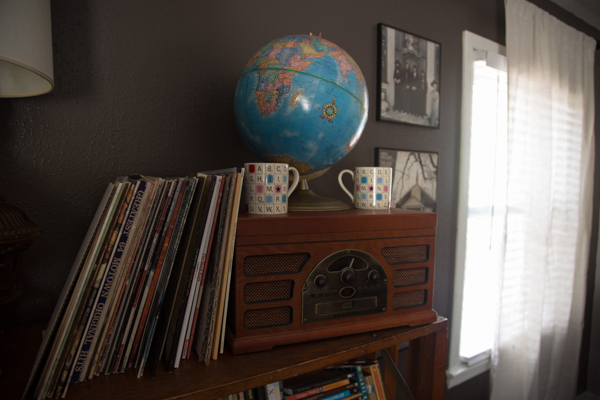 This home is full of stories. Come over, we'd love to share them with you. We made the piano area, for no particular reason, a tribute to our country. 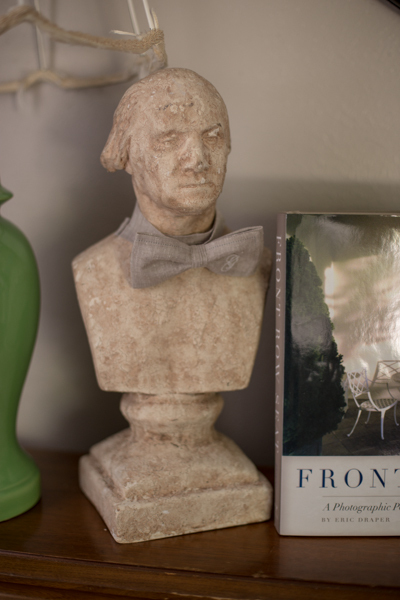 After we found our presidential busts, how could we not? I love this area so much! Lastly, we have our scrabble board. Please refer to the "prologue to the blog" tab for its importance. Featured above: the blue velvet couch. Let me be honest, I hated them. Especially in Byron's last residence, The Nicholas Cage, a house full of testosterone, fratty gents, and fast food trash, this couch was not appealing at all. But, Byron's sister and Pinterest warmed me to the idea of blue velvet and now I love them. Plus, the deep blue matched perfectly with the brown couch pillows. Add a few pops of color from these fun C&B pillows, and I am overwhelmed with love! The theme of this room ended up being nature-esque with some artwork from Byron's past (which, again, I greatly disliked in his old place) and several tiny birds from our wedding decor. Do you like it? We do! 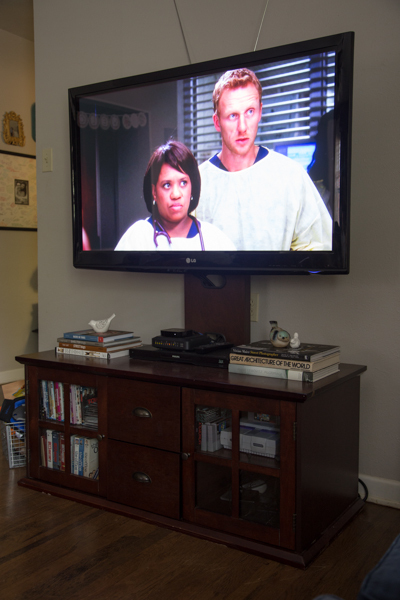 Also, I had to show you our TV console with what we are currently watching. Byron is every so sweetly making his way through all seasons of Grey's to catch up with me so that we can watch it together when it returns. I love him so very much. After two weeks, we already love it here. I had my hesitations. I loved my old place. But this is a home, a true home, with no noises above or below or even beside us, with room to entertain, to dine, to share, with a backyard for sweet Eleanor! We love it here! We can't wait for you to come over! Tim Gunn always says, in a most fabulous way, "make it work." I share that attitude on many things--group projects, unforeseen circumstances, unsolvable problems, & etc. Regarding certain paint colors, however, I say, "Forget you, Tim Gunn, I'm going to Lowe's!" Over the next few weeks, we will be consumed by painting projects; not too many, but enough to make our new home magazine shoot ready, if that were to ever be asked of us (any takers?!). Today, I will unveil the before pictures of our home, allowing you to see the bare bones of what we were working with before our AMAZING movers helped haul all our stuff in. Some of our rooms are almost presentable, but a few are still works in progress. Here's a thought I had...I think the way you go about decorating a new home speaks to what you are like. I could most certainly be reading in to this and humble bragging, but it doesn't feel like that, so I am going to keep sharing. 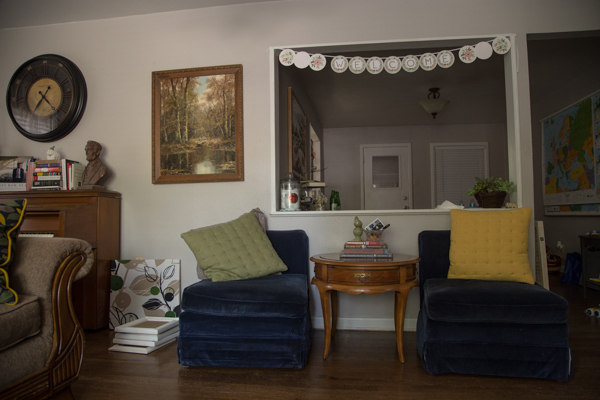 The first room we tackled was the living room--the space where, ahem, people live. Why? because this is the chill room, the room for relaxing, for taking a breath (where our dad's sat for most of moving weekend), ...for escaping the clutter of the rest of the house. It is also the first visible room, so I had to make it presentable. Keeping up with my silly correlation, by creating this space first, Byron and I must be people who want to have people over, people who like to appear clean and tidy (probably just me), and who like a place that feels good. Second room that is most complete, the dining room. Anytime we discuss our future, we end up brainstorming dinner party themes, different events to have people over for, holiday celebrations... we are excited to entertain and ready to serve! Most unfinished room--the bedroom. Unlike my other 5 years in Waco, my bedroom is FINALLY separated from my office/computer/living space. We have walls to divide different areas. I read a study during my freshman year about the poor side affects of having a sleeping space mixed with any other space. By doing so, you confuse your brain on what is to be accomplished in a room. Now, our bedroom is for relaxing only! But, we aren't really good at that, so we have left it last. I'll let you know about our plans, and slowly, we shall unveil our triumphs room, by room. I will also show you a few furniture pieces we are working on--I am excited! First up: the open living space...this gallery includes the living room, dining room, and a sneak peek at the kitchen. LIVING ROOM: What we want to do in this room: change the 'accent' wall to match the rest, which is actually a great grey color. We think this will open up the space more and allow the natural light to shine even more. Also, curtains on the open window wall. Just pushed to the side, they will look fabulous. DINING ROOM: No paint changes, maybe one little curtain in the back, but this room is pretty great...it just needs decorating. KITCHEN: We are so satisfied. I love the white. If I could...I would paint the insides of the top cabinets and take off the doors. We'll see if that happens. It would be a very long way off, and right now this place is only ours for 10 months! Crazy! Also, I think maybe more curtains...never have I ever loved them before, but Pinterest, you know? Now for the other half of the house...guest bedroom, office/study/creativity room, and master bedroom. GUEST BEDROOM: Light blue/grey in color, not my favorite, but this is not a room I particularly care about to do a total redo on, so it shall stay. Obviously, curtains, and that is all! This bedroom has it's own bathroom for our guests, so come stay! Please! OFFICE/STUDY: I might be most excited about this room. We are going to switch out that top blue with chalkboard paint... oh man! This room is going to be amazing. I can't wait to create things in here (did you know I have an etsy store?) and watch Byron edit all of his amazing pictures (did you know he is a photographer?!). Not sure what to do about the drawers... a little kiddy with those big knobs, so I'll probably replace those. And no curtains in here...but something around the window. MASTER BEDROOM: Obviously, this is Eleanor's room. We will repaint it some time. It's a tan/gold/yellow right now. I am thinking a grey. (Do y'all see any trends in what I like?) 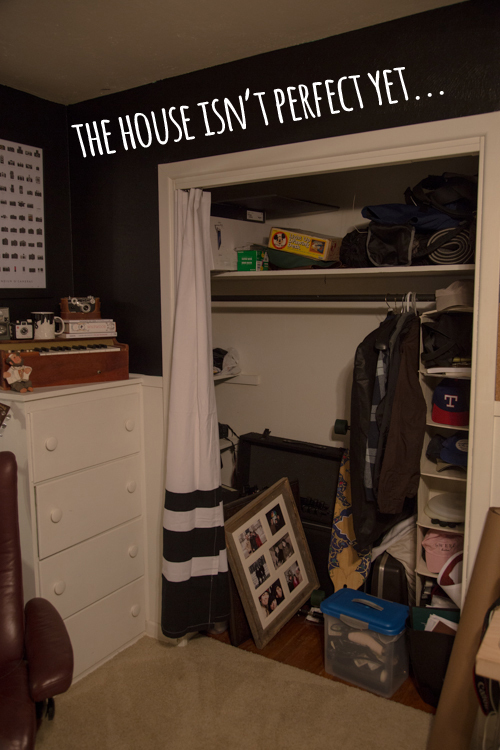 Those are our big closets. I want to think of something creative to do for them that still allows them to slide...maybe we'll use some of the leftover chalkboard paint and decorate a his/hers side. This room is ready for curtains! MASTER BATH: OH, lawd... We want to repaint the top. And OBVIOUSLY, despite the "charm" some say the tile has, I think Byron might go crazy, and I might too, if the tile is pink for much longer. So, anybody know how to paint tile? I've seen it on Pinterest...any good links out there? That completes the bare bones house tour. Thank you for letting us share this time in our lives with you. This home is something Byron and I have been excited about for months, and we are excited to welcome you into it, either in person, or over the internet! We made a gallery wall! Part of the old wall...right after B moved in, we took some pieces down to make room for new furniture. This past year, alone in my loft, I created a new gallery wall. I included some of the chalkboards, and added all the meaningful pieces that people had created for me over the years. Gallery Walls aren't especially easy to create. Lots of nailing, stepping back, rearranging; thinking about spacing and balance...but when it is done, nothing makes you feel more at home than having a wall of memories. Part of the old wall. This is from one of our engagement shots! 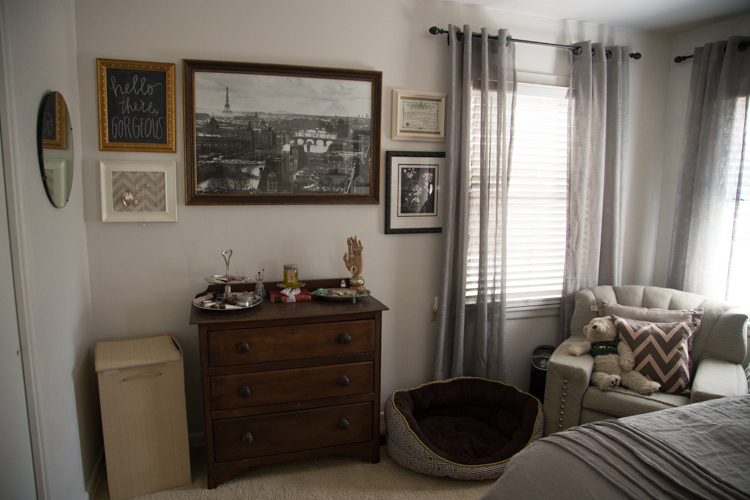 When B entered the picture, we added his furniture, rearranged, and soon I only had a 1/2 gallery wall. Time to rearrange! Byron and I wanted to add pieces that were now meaningful for the both of us. The chalkboards were an easy fix! The album art...not so much. Previously, I had Simon & Garfunkel, Mumford & Sons, and Jack's Mannequin. B didn't love having the faces of Paul and Art staring at all of our guests, so we switched it for the Beatles, and all was resolved. The 2 new pieces worth noting: a poster of cameras from the beginning of photography to now (B's groomsgift). And the matted sketch that my grandmother drew of a picture of my great grandma, Millicent (that's my middle name!). 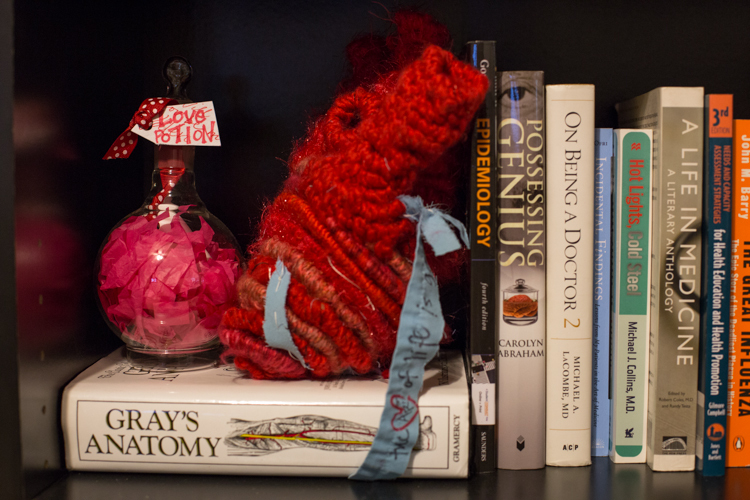 We also added a few lovey dovey pictures of ourselves, and a handwritten type piece I did. The making of our gallery wall! I have since had Byron rearrange it. Total perfectionist. Come over to see it complete! 1. Pick a central piece and hang that first. It doesn't necessarily have to be the biggest piece, but it should be a larger piece you want to be the main focus! 2. Odd is better than even. This is an all-around decorating tip. It is more appealing and interesting to have an odd number. It is also easier to have things look more collage-y, if there is an odd number. 3. I like to add in a sort of pattern to help with balance. Here, we added to one side then the next, then above, and below, then continued until it was perfect...almost. 4. I like to have a theme, but this could just be me. Some gallery walls look cool with all sorts of different stuff, but I like to maintaing similar colors or types of pieces. Here, we chose black, white, and gold. 5. Don't stress. Work with someone you love (or someone who will not be upset when you ask to move the same piece just one more time). Step away from the wall for awhile. I think it's best to give it a day, wake up and look again, make final adjustments and let it be! Have fun! Comment if you have questions or comments!